Directions in HTML text and PDF formats. Schedule of Services in HTML text and PDF formats. Parish newsletter available in PDF format. Viewing the parish newletter, bulletin and schedule of services requires the use of the Adobe Acrobat Reader, which may be obtained by clicking on the "Get Adobe Reader" link graphic. All Services are in English. We follow the Julian Calendar. Saturday Vespers, Sunday Liturgies, and all classes/catechisms are held at the church location at 397 Melvin Avenue, in Hamilton. Some midweek services are held at the domestic chapel. Please call (905) 318-6436 for information. All Saints of North America Orthodox Community was born in 2001 as an informal meeting of several English-speaking Orthodox faithful who assembled for regular Vespers and Typica services with the blessing of His Grace Bishop Seraphim of Ottawa. The community has been blessed to receive many new converts to Orthodoxy over the years. Since May 2003, with the ordination of Father Geoffrey Korz to the priesthood, we have enjoyed regular Liturgies. From September 2003 to December 2005, we moved for Sunday morning Liturgy into the lower level of the St. Stephen's Anglican hall. In January of 2006, the parish moved to a commercial space above a dental office at 117 Queenston Road in Hamilton. This church location allowed easy access from the local highways, as well as roomy facilities for services, luncheons, and the Desert Wisdom Bookroom, an Orthodox book and supply shop run by the parish. In January of 2009, a new church building was purchased at 397 Melvin Avenue at Woodward Avenue, in the heart of Hamilton's East End. With the help of many donors, friends, volunteers, and an excellent crew, renovations on the new building took many months of careful labour on the former bank building. The parish moved into the new church in January 2010, now enjoying an accessible building, worthily appointed for the worship of God, with meeting and fellowship space for the faithful. A newly-expanded Desert Wisdom Bookroom opened around Pascha 2010. Our community continues to grow, and we remain deeply convinced of the need for an Orthodox mission in the English language in this hub of the "Golden Horseshoe" region of southern Ontario, and prayerfully look to Our Lord's Holy Mother and all the saints of North America for their prayers to send to us those who are truly willing to labour in this field. AN AKATHIST will be offered EACH WEDNESDAY at 6pm for the needs of the faithful, families, and friends. The original Akathist Hymn was composed by St Romanos the Melodist, for the purpose of asking the prayers of the Mother of God, and it continues to be the most commonly used akathist to this day. The saints of God offer up their prayers for the needs of the world. In praying the Akathist service, we ask them to intercede with God for our particular needs. Saint John Maximovitch is known for his prayers for travellers and missionaries, St Seraphim of Sarov for his prayers for those suffering from a variety of problems, including addictions, St Mary of Egypt for those enduring sexual passions, St Nectarios of Aegina for those suffering from cancer and other conditions, and St Xenia of St. Petersburg (Russia) for those seeking a home, a job, or a spouse. While there are many situations in which we seek help for ourselves, or seek to offer help to other people, perhaps the most effective thing any faithful person can do, is to first and foremost ask for the mercies of God and the prayers of His saints. Over the last year, we've set up an online connection at the Hamilton parish website, asna.ca, which allows individuals to make both one-time donations, as well as regular monthly donations. For small and medium-sized donations, CanadaHelps is an excellent, efficient way to ensure your help in our mission efforts can be put to use right away. Arranging monthly online donations are a particular help to the work of the church, since they provide stability to maintain everyday, necessary administration and site functions (including covering the ever-growing cost of utilities), leaving our clergy and faithful free to concentrate on the main work of the holy services, catechism, and Church outreach. Each donation is subject to a processing fee, plus a surcharge of about 3% of the total amount - thus, for a gift of $100, about $3 dollars will go to the fee, another $3 dollars will go to the surcharge, and about $94 will go to the church. As such, those wishing to make a larger donation to the mission work of the Church are encouraged to make it directly to the parishes, using cheque or money order, in order to avoid substantial loss due to the fee structure. For most donors, CanadaHelps provides a smooth and ideal option to regularly support the work of Christ's Church, minimizing the inconvenience of scheduling donations each month and preparing cheques or donation envelopes. Please visit CanadaHelps.org, donations to St. George's can also be made through this page: simply include a memo stating your intentions), and sign up for this worthwhile service. 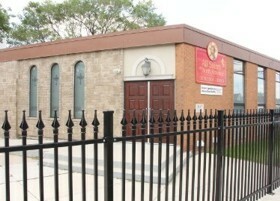 Saint George's Orthodox Church in Brantford currently functions under the missionary umbrella of All Saints of North America parish in Hamilton. As such, all donations (receiptable and otherwise) are required to go through the account and charitable oversight of All Saints of North America. Please make cheques to parish payable to "All Saints of North America Orthodox Church", for both the Hamilton and the Brantford parishes, and include a memo to indicate any funds to be directed to the Brantford parish. Charitable receipts will be issued at year end, and both churches are under the incorporation and charitable number of the Hamilton parish. Please note that in a few instances, banks have refused to accept cheques made out to "ASNA" or "ASNA Orthodox" - please use the full name of the parish. Your help is much appreciated. The 16th Annual Orthodox Spirituality Series will take place on Saturday October 19th 2019. With featured speaker: Mother Theadelphi of the Skete of the Entrance of the Mother of God, Perrysville Ohio. Further details to be provided in the months ahead. SPECIAL THANKS to all who continue to support our parish through Property Care, Potluck Food, Charitable Works, Consistent Tithing, Prayers for those Sick & in Need, Assistance with the Holy Services. May God bless you for your contribution to strengthening our church! Our parish DESERT WISDOM BOOK ROOM is open following most services, and by appointment or request. Please note that due to the simplicity of this parish operation, we are unable to track customer accounts, and as such, the Book Room is unable to offer credit for any purchases (i.e. "Paying later" for a book requested today). Please do not request credit: if you would like to place a book on hold, for pickup and payment at a later date, we would be happy to arrange this for you. Please join us for ORTHODOX COFFEE TALKS most Sundays during Great Lent following the Potluck Luncheon. These sessions are primarily intended for catechumens - inquirers and other faithful are also welcomed to join us. ORTHODOX COFFEE TALKS and Catechism will take place each Sunday of Great Lent, following the Potluck Luncheon, starting on the Sunday of Orthodoxy (March 17th) until Palm Sunday (April 21st). Session will run between 90 minutes and 2 hours, and are a required part of Catechism formation for our Catechumens and Inquirers. All faithful and guests are welcome to join us for these sessions, to learn more about the Orthodox Christian Faith. CHARITABLE WORKS COLLECTIONS in support of those in need in our community will be taken up at the Hamilton parish on Sunday March 24th, and Sunday April 21st. Funds collected go directly toward meeting requests for assistance with groceries from those inside and outside the parish. If you know someone in need who may be too shy to make this known, please tell the priest, and help will be made available. AKATHIST PRAYERS will be offered each Wednesday night for particular needs of the faithful. Please see the parish calendar for details, and plan to attend these services, offered in the middle of each week for the health, strength and salvation of the faithful. PRAYING FOR OUR PARISH FAMILY - An insert is included with the mailed version of this calendar. You can e-mail Archpriest Father Geoffrey at: korzg@hotmail.com for any needs requested, and for immediate requests for prayer. Our prayers for each other are important - please pray daily for each member of the parish, and for the departed. WE WISH MANY BLESSED YEARS to Mary D. (March 10 Bday, Bruno Antonio C. (March 10 Bday), Alexander (Alec) L. (March 22 Bday), Sofia H. (March 26 Bday), Laura M. (April 18 Bday), Andrei D. (April 22 Bday), Evangelos T. (Mar 25/April 7 Namesday). Please advise the priest of any other occasions. ALL ARE WELCOME to come forward after Liturgy for prayers for their own health, for travel, for those seeking or starting employment or projects, and for women who are expecting a child. Please feel free to speak to Archpriest Father Geoffrey privately for these prayers, if this is preferred. EMAIL LIST: If you would like to add or remove a name from the parish email list, please contact Archpriest Father Geoffrey at: korzg@hotmail.com.